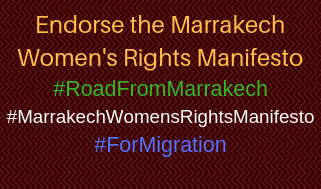 The Women in Migration Network has a delegation of a dozen leaders at meetings related to the inter-governmental Global Forum on Migration and Development 2016 (GFMD) in Dhaka, Bangladesh. Members began with the People’s Global Action on Migration, Development and Human Rights from 5 – 7 December, where WIMN members played a leadership role in several thematic areas including a focus on global migration governance, borders and countering xenophobia. WIMN also hosted a Women’s Caucus. WIMN served on the PGA Coordinating Team. On 8 December, WIMN joined over 300 representatives of civil society for the Civil Society Days of the GFMD. WIMN contributed the Women’s Bridging Document for the event, and WIMN member Roshan Dadoo of Consortium for Refugees and Migrants in South Africa (CORMSA) serves as the Rapporteur on Women. WIMN hosted an open Women’s Caucus to frame key points on gender & migration for the Global Compact on Migration, and a Side Event co-sponsored with UN Women, on advocacy strategies for engendering the Global Compact. The CSD-GFMD culminates in an “Open Space” with governments on 10 December. WIMN members will participate in thematic meetings with governments, including on gender and on xenophobia. 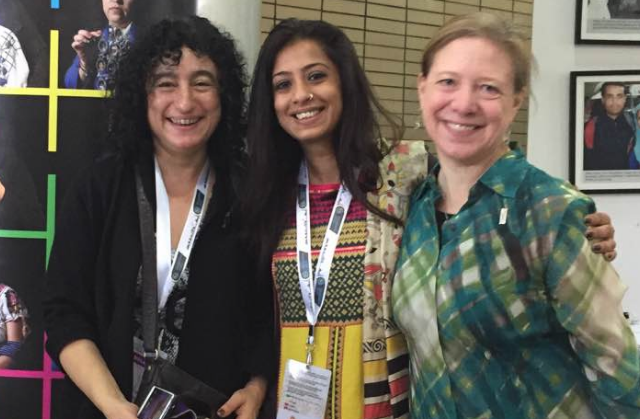 Several WIMN members serve on the International Steering Committee that plans the CSD-GFMD. WIMN representatives at the CSD-GFMD are from Kenya, South Africa, Eritrea, Mexico, the Netherlands, the Philippines and the US. WIMN is a member of the Global Coalition on Migration.